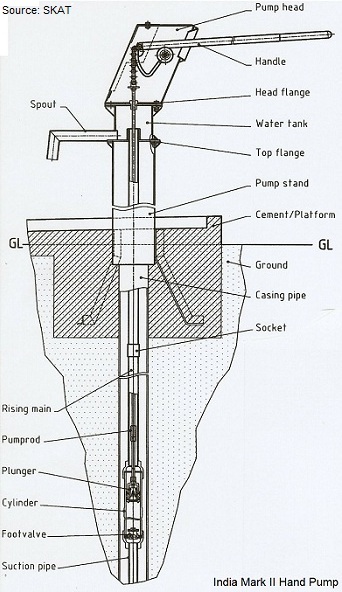 Development of the India Mark III hand pump arose out of the community-level experiences of those who produced, installed, and distributed the India Mark II pumps. The India Mark II pump is one of the most widely used hand pumps around the world. But it is not suited for village level operation and maintenance (VLOM). Because the Mark II water well hand pump has a closed-top cylinder, every time the pump cylinder components require maintenance or replacement, the riser main, pump rod, and cylinder all have to be pulled out of the well. During development and distribution of the India Mark II, experiences in the field and the laboratory made the developers of that water well hand pump aware of the need for communities to have the ability to maintain and repair their own water pumps without relying on too much outside support. In addressing this issue, the developers sought to research and design a hand pump that offered those repairing them the ability to remove the piston and foot valve for maintenance without removing of the riser main. The VLOM strategy appeared to be a technological strategy. That is, the solution to villages and communities being able to repair and maintain their own hand pumps was seen as a technological problem that could be solved by the development of pumps that were VLOM-capable. Experience in the field soon revealed, however, that there were more than just technological reasons for water well hand pump break downs and a lack of maintenance. Pumps became broken and remained inoperative for many reasons. Sometimes there were no mechanics to work on them or the mechanics were not available. Sometimes tools would be missing, stolen, or broken. Sometimes spare parts were not available. Sometimes there were no vehicles available or fuel for vehicles needed for transportation and repairs. Development of user-friendly water well hand pump technology that villagers, with a minimum of training, could work on as hand pump mechanics ultimately led to the need for deeper community involvement, responsibility, and ownership in all aspects of water resource development. The interpersonal, partnership, trainer/facilitator model of community development became more prominent and important. Community participation and management became as important, if not more so, than the technology. Now that VLOM pumps are available, it is incumbent upon the community to be responsive and capable in maintaining and repairing their own hand pumps. VLOM means not only new developments in technology but also new ways of thinking in terms of the implementation and maintenance of that technology. The India Mark III water well hand pump was developed in response to the technological problems presented by non-VLOM pumps (the India Mark II is not the only pump being used that is not VLOM capable). The India Mark III Water Hand Pumps are conventional lever action hand pumps just like the India Mark II. Similarly, the Mark III is a public domain pump and is manufactured and distributed by corporations worldwide. The India Mark III water well hand pump can be used in deep well conditions up to 60 meters (200 ft.). The India Mark III pump is identical in design to the India Mark II deep well hand pump except for the open top cylinder, and the 2 1/2" (65mm) riser main and a water tank holder suitable for the 65mm riser pipe. Of the above-ground parts, only the Mark III water tank is different from the Mark II, but they have the same bolt spacing. Therefore, it is easy to convert an existing Mark II pump into a VLOM Mark III pump by replacing only the water tank and the riser main. The above-ground mechanism, as in the Mark II, is constructed of welded steel plate for strength and is hot-dip galvanized for corrosion resistance. These parts may be locally manufactured. The chain and quadrant mechanism of the pump handle provides easy and accurate alignment of the connecting rod (see illustration). The 65 mm ID cast iron open top cylinder with brass liner is fitted with a bottom end cap to receive the foot valve and a top end cap to facilitate extraction of piston assembly and foot valve assemblies for repairs without lifting the riser main. By providing an open cylinder, the connecting rods and plunger assembly with piston seals can be pulled out without removing the riser pipes. This enables easy repair and maintenance of the water well hand pump at the village level. Further, by providing an additional plate on the pump head. The complete pump head assembly with the handle can be easily removed and fixed. This also makes maintenance simpler. Even a village mechanic with some skills can repair this pump with simple tools, whereas in other hand pumps, special tools and more trained mechanics are required to carry out maintenance and repair activities. When first introduced, the Mark III water well hand pump had a galvanized iron riser main. Since the riser main is larger in diameter than the Mark II riser, the larger pipe weighed much more and also cost more. Current models of the Mark III are supplied with PVC riser. Two different cylinder/riser main diameters are available; 50 mm (2”) and 65 mm (2.5”). Of these, the 65 mm (2.5”) is more popular. Galvanized steel riser main is heavy and must usually be pulled from the well using a block and tackle mounted on a tripod above the well head. One additional advantage to those VLOM pumps employing PVC pipe rather than galvanized steel for the riser main is that the block and tackle/tripod set up used for pulling out heavy steel riser main is not required. The riser main can easily be pulled out of the well by two people and by hand. 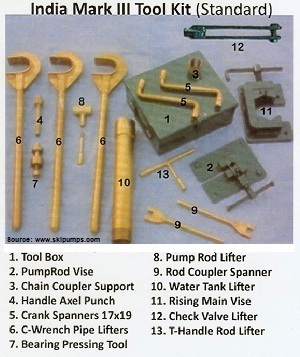 Below you will find a standard tool kit used for maintenance on the India Mark III hand pump. The C-wrenches (#6) are used for manual lifting of the riser main when a block and tackle is not required. The riser main vise (#11) and the pump rod vise (#2) are used to clamp those components while installing or removing them, preventing them from falling into the well. Additional tools are also required such as pipe wrenches (1@18" and 1@24" and 1@36"), open-end wrenches (17mm and 19mm), and adjustable spanner, among others. * With a proper top cap some Mark II cylinders can also be converted to an open-top design (but the foot valve can’t be easily removed). * In the India Mark III, the PVC riser main is attached to the pump head with an adaptor plate and rubber ring of the same type as that used on the Afridev pump (but they are not identical). * The 50mm (2”) brass India Mark III piston will work in an Afridev cylinder, but the Mark III footvalve will not properly seat in the Afridev cylinder. A manual for the India Mark III hand pump has been published by the International Center for Community Water Supply and Sanitation (IRC). It is available as a PDF file here. Return to "Introduction to Hand Pumps" from ""Water Well Hand Pump"